The Occunomix TD800 Cooling Head Gaiter can be worn in several different ways. 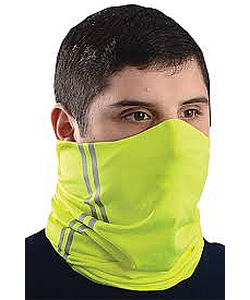 This TD800 cooling gaiter can be worn over the head--partially covering the face--or by wrapping around the neck. The Tuff & Dry fabric cools the skin temperatures by 30% when the cooling fabric is activated. Simply run the fabric under cold water and 'Snap' the fabric to activate the cooling properties of the fabric. The latest technology in cooling fabrics for outdoor workers. Offers UV Protection for the face and neck helping to protect from harmful UV Rays. The Occunomix TD800 Cooling Head Gaiter can be worn in several different ways. This TD800 cooling gaiter can be worn over the head--partially covering the face--or by wrapping around the neck. The Tuff & Dry fabric cools the skin temperatures by 30% when the cooling fabric is activated. Simply run the fabric under cold water and 'Snap' the fabric to activate the cooling properties of the fabric. The latest technology in cooling fabrics for outdoor workers. Offers UV Protection for the face and neck helping to protect from harmful UV Rays.